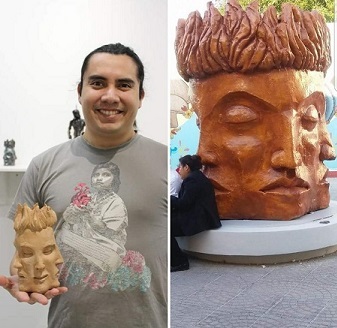 Sculptor, David Manzanares, interprets the world through the virtue of hands. He is continually sculpting and understanding his surroundings through a piece of modeling clay that he carries. In minutes, he is able to masterfully create an expressive face of the person to whom he speaking or use the ball to interpret a particular situation. He uses this ability to captivate workshop participants and it allows him to teach a number of forms, abstract to figurative. David, originally from Mexico, has relocated to Lincoln with his Nebraska-native wife and two young children. His residencies focus on the use of figurative forms, both human and animal, utilizing a variety of mediums while incorporating aspects from his cultural background. Currently, David is the Resident Sculptor at the Nebraska Innovation Studio in Lincoln.